It was pure chance that I saw this Bench Mark (BM) on Marsh Lane on November 23 2017. Being close by the area I had only intended to have a quick look at the work going on at York Street where some old trams tracks had recently been dug up. Seeing little change I was going back but, having not done so for very many years, I decided to walk to the old Marsh Lane Station area just to see what was there at what I knew has long been a mainly empty area. To my surprise I spotted this nice BM at the Marsh Lane entry/exit point. On looking up old maps I found what is almost certainly this BM is marked on a 1951-1954 1:1,250 map (Marsh Lane Station was still there then) but it was not marked (possibly due to the scale) on a 1921 1:2,500 map. The first photo is a close-up of the BM and the second shows its general location by the yard. Leo the BM you have highlighted was the entrance to the Goods Yard, I thought at first it was the one on the bridge just a couple of hundred yards away, see below. Thanks for that information buffaloskinner . I walked under that bridge yesterday (Nov 23 2017) but never thought to look for a BM though I doubt I would have spotted that one on at least a cursory look. This Bench Mark (BM) caught my eye while having a cursory look around as I walked on Dock Street, Leeds, on March 6 2018. I've walked by there several times in recent months but have never spotted this BM before so it was a surprise that I spotted it now despite it being quite clear and in good condition. The first photo is a close-up of the BM and the second shows its location on Dock Street (it is on the second block up on the right). It was by chance that I spotted this Bench Mark (BM) by Eccup Lane, north Leeds, on March 20 2018. The BM is on the right about half way between 5 Lane Ends and the nearby kennels. I've now looked at old maps and found there was a BM there (or extremely close) in at least 1893. As the BM does not look to be badly weathered it may or may not be the originally carved BM. The first photo is a close up of the BM and the second shows its location on the right hand pillar of the gate. I knew from maps that there might be a Bench Mark (BM) in a spot in Scotland Wood so I had a look for that BM during a stroll on April 9 2018 and I managed to find it on a very isolated pillar. The pillar is a little off the high track on the Adel side of Adel Beck in what I think might be Scotland Wood but it could still be Adel Wood. It is located in a wooded area immediately next to a field shortly after passing near the Seven Arches viaduct (going downstream). It does seem to be a very isolated spot to have put a BM but presumably it was necessary in mapping the area. A BM is noted there in a 1954 1:2,500 map but is not noted in a 1934 1:2,500 map. The first photo is a close-up of the BM and the second shows the isolated pillar it is on. I knew from old maps that there was (still is?) 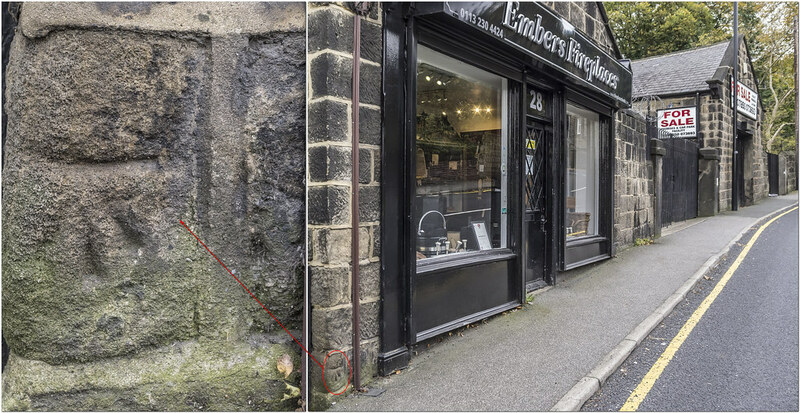 a Bench Mark (BM) on a building at the corner of Kirk Ings Yard and The Calls as a BM is marked there on a 1910 1:500 map in the Old Maps UK website. It is not though marked on a 1908 1:2500 map but that has a BM very close by so I wonder if it is the same BM but positioned wrongly. Neither seems to be marked on older maps. I have had cursory looks for the BM when passing but never spotted it until I did on June 26 2018. The BM is only partially in view and did not look like it was original. I have now had a look at the UK Bench Mark Database website and found the BM was seen on September 24 2017 and stated to be damaged and having just the arrow lines. On earlier visits it was stated to be a filled out mark going back as far as August 4 2008. These are 2 photos I took on June 26 2018. The first is a close-up of the BM and the second shows its location just on The Calls frontage at the corner of the building.